I like having spiders at home - yes, I know, it is a bit weird and they might scare the visits. A couple of years ago we had an enormous garden spider (Araneus diadematus) in our kitchen, next to the back garden door and it eventually attracted a male. We watched the whole courtship over breakfast - live - it was fascinating. The male was extremely careful and moved slowly. A few times there was contact between the pair's legs. Unfortunately the poor male must have taken the wrong step, as the female grabbed him, and unceremoniously rolled him in a broad band of silk band and ate him. From then on we called her 'The Cannibal' and released her outside a little afterwards for her to lay eggs. I am not sure that male managed to mate before being eaten. Living on a restricted diet indoors, the female probably saw him more like food than like mate. 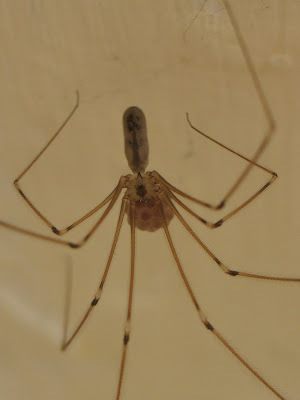 Anyway, don't let me get distracted, I was going to talk about Daddy long legs spiders, Pholcus phalangioides, to be precise, who had lately fascinated me. If you have an outside toilet or a room next to a garden, have a look at the corners of the ceiling. You can maybe see thin 'upside down' spiders with spindly legs. 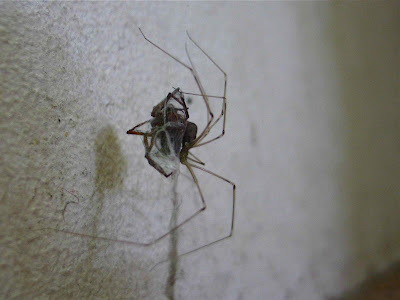 Then a few days later I noticed that a Pholcus living in the outside toilet had a sac of eggs. I pulled the camera out to take some photos and, after looking at them realised that the female carries the eggs in her mouth, but they are not wrapped in a cocoon like other spiders but are visible, probably held together with a little silk. Apparently the females live for several years and can protect the eggs themselves - and possibly the spiderlings - also, because the females move to a different spot every few days, it makes sense to carry the egg sac with her. A digital natural history notebook?